The processing methods used for Gyokuro are largely the same as those used for Sencha. The difference lies in the ways the trees are grown, that is, unshaded for Sencha vs. shaded for Gyokuro. To understand the manufacturing process, it is best to start with an introduction to traditional methods. 1. Freshly picked leaves are immediately steamed. While steaming, a charcoal fire is built in a Hoiro, a flat stove set under the rolling table. The Hoiro has a replaceable board called a Jyotan. Countless sheets of traditional Japanese paper are pasted one over another to make the Jyotan. 2. Steamed leaves are spread over the Jyotan board and dried for about 25 minutes with the heat of charcoal fire below. The leaves are continually and gently mixed throughout this process. 3. As the leaves are rolled over and over by hand, their moisture gradually dissipates. This laborious process lasts nearly one hour and twenty minutes and requires more handiwork than any other process. Towards the end, the scent of fresh green tea is potent. One of the last steps in the process is Itazuri or "rolling on a wooden board". 5. In the final step, the tea leaves are spread thin on the paper top, or Jyotandai, rolled over from time to time, and gently fanned with an Uchiwa, a Japanese flat paper fan with a bamboo frame. Stems and larger leaves are sifted out on a coarse meshed bamboo sieve called a Zaru. It takes about five hours to complete this entire process by hand. The individual characteristics of tea leaves are determined mainly by the location of the tea fields in which they were grown. Even within the Uji region itself, the taste, color, aroma and richness of the tea all differ depending upon the location of the field. Blending brings out the best in different teas, resulting in a harmony of enhanced flavors. 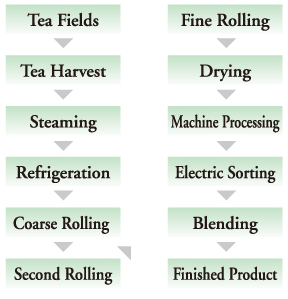 This is all done with respect for the process and a professionalism dedicated to manufacturing the highest quality tea possible. We only provide our customers with tea that we can be proud of. We would be delighted to hear your comments, questions, and requests.